Format: Price includes; Team shirts, music at games, 7 regular season games + tournament, champ prizes, weekly free pitcher at Tin Roof. Team price is based on 11+ players. Teams with less than 11 can play. Captains account will be charged the difference. Format: Price includes; Team shirts, music at games, 7 regular season games + tournament, champ prizes, weekly free pitcher at Tin Roof. Team price is based on 14+ players. Teams with less than 14 can play. Captains account will be charged the difference. Format: All individual soccer players sign up through this league. Once at least 11 players sign up that can play on the same day a team will be created and you will be transferred into a league. Format: Price includes; Team shirts, music at games, 7 regular season games + tournament, online scheduling, champ prizes, game reminders, rain out texts, and post game happy hours at Tin Roof with a FREE pitcher of Bud Light. Format: Price includes; Team shirts, music at games, 7 regular season games + tournament, online scheduling, champ prizes, game reminders, rain out texts, and more. Format: All individual volleyball players sign up through this league. Once at least 6 players sign up that can play on the same day a team will be created and you will be transferred into a league. Format: All individual basketball players sign up through this league. Once at least 8 players sign up that can play on the same day a team will be created and you will be transferred into a league. Format: All individual flag football players sign up through this league. Once at least 12 players sign up that can play on the same day a team will be created and you will be transferred into a league. Format: All individual softball players sign up through this league. Once at least 12 players sign up that can play on the same day a team will be created and you will be transferred into a league. Format: Price includes; Team shirts, 7 regular season games + tournament, 2 games per week, shoe rental, weekly free pitcher at Tin Roof. Team price is based on 7+ players. Teams with less than 7 players can play-captains account will be charged the difference. Format: All individual kickball players sign up through this league. Once at least 12 players sign up that can play on the same day a team will be created and you will be transferred into a league. Format: Price includes; Team shirts, music at games, 7 regular season games + tournament, online scheduling, champ prizes, game reminders, rain out texts, and post game happy hours at Tin Roof with a pitcher of Bud Light for each team. 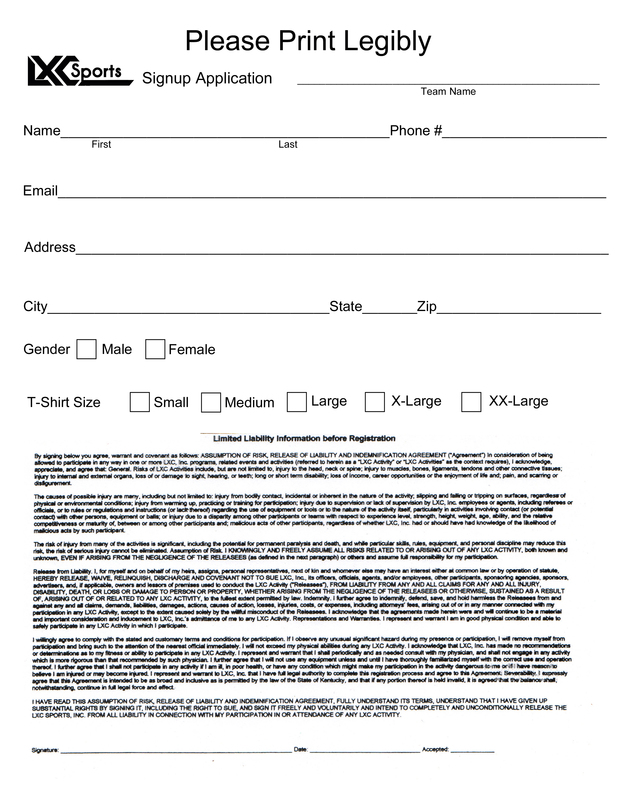 Format: All individual bowling players sign up through this league. Once at least 6 players sign up that can play on the same day a team will be created and you will be transferred into a league.